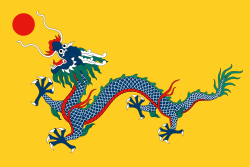 The Qing dynasty (Chinese: 清朝; pinyin: Qīng cháo) was a dynasty of rulers of China from 1644 to 1912. The dynasty was founded by the Manchus and so its other name is the Manchu dynasty. The surname of the Qing emperors was Aisin Gioro. In 1580, Nurhaci became the Jian Zhou general of the Ming dynasty. He unified the Manchu tribe and organised the Eight Banners. In 1616, Nurhaci declared himself Khan (King) and founded the Jin dynasty in Liao Ling. In 1626, Nurhaci led armies to attack Ning Yuan. Unluckily, Nurhaci was wounded by Yuan Chonghuan's Portuguese cannon and he died 2 days later. Huang Taiji, the son of Nurhaci, then succeeded to the throne and became the Khan of the Manchu tribe. In 1643, Huang Taiji was dead, caused by apoplexy. Shunzhi Emperor inherited Huang Taiji's throne. Prince Dorgon became the regent. In 1644, the Manchu armies conquered the north of China. The capital was changed to Beijing. The Ming dynasty was overthrown, though fighting continued until 1683. The self-strengthening movement (Chinese: 洋務運動 or 自強運動; 1861 - 1895) was a reform organised during the late Qing. With the defeat in the Opium Wars and the outbreak of Taiping Rebellion, the emperor and the imperial officials realised that it was necessary to improve the country's state with a series of reforms. Therefore, the Self-Strengthening Movement was started. The movement could be divided into three phases: the first phase (1861 - 1872), the second phase (1872 - 1885) and the third phase (1885 - 1895). The major leaders are Yixin, Prince Gong (Chinese: 恭親王), Wenxiang (Chinese: 文祥), Zeng Guofan (Chinese: 曾國藩), Li Hongzhang (Chinese: 李鴻章), Zuo Zongtang (Chinese: 左宗棠), Shen Baozhen (Chinese: 沈葆禎) and Zhang Zhidong (Chinese: 張之洞). However, owing to the conservatives opposition and the problems of modernization, it failed finally. Arsenals were built in Shanghai and Xiamen. Shipyards were built in Fuzhou and Tianjin. The Beiyang Fleet was organized by Li Hongzhang. Many industries were built in the South of China. The Zongli Yamen, a foreign office of the Qing dynasty, was set up in 1861. In 1868, the Qing government sent its first official diplomatic mission aboard. With the failure of the Self-Strengthening Movenment, the defeat in the First Sino-Japanese War and the scramble for concessions, many Chinese leaders realised that reforms were urgently needed. Thus, the Hundred Day's Reform (Chinese: 戊戌變法; 11 June 1898 - 21 September 1898) was started in 1898. The leaders of the reform were Guangxu Emperor, Kang Youwei (Chinese: 康有為) and Liang Qichao (Chinese: 梁啟超). Eventually, it ended in a coup d'état led by Empress Dowager Cixi. Useless government posts were to be abolished. Modern banks would be built. Railways were to be built. The army and navy were to have modern weapons. A national militia would be organised. The Manchus changed their ways to be more like the Chinese in order to rule them better. The Manchus started wearing Chinese clothes and writing in Chinese. They began to enjoy Chinese food and art. One of the Manchu emperors, Qianlong Emperor, began to worry about how much like the Chinese the Manchus were becoming and he tried to get Manchus to be more Manchu. Qianlong Emperor made Manchus ride horses and shoot bows and arrows so that they would remember where they came from. The Chinese people used different types of clothes like maccukau, konaha, schinin and sakahn. In the early Qing, Guangdong was a province. There were totally 79 counties. In 1911, it was checked that there were 5,041,780 households, approximately 28,001,564 people. The famous mountains in Guangdong were Lingchau, Huangling and Luofu. Dongjiang, Beijiang and Xijiang were the most important rivers in Guangdong. Guangzhou, Zhaoqing, Xiamen and Fujian were the major Guangdong cities. History of Ming, compiled under Zhang Tingyu in 1739. Draft History of Qing, compiled under Zhao Erxun in 1927. This page was last changed on 19 November 2018, at 05:27.